Let’s start with the easy part—the base. 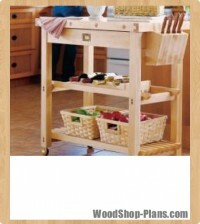 Because of the sheer weight of the 4″-thick top, a sturdy base is essential. My block sits on four cherry legs with full aprons at the top. A through-tenon shelf and side skirts lock everything together. 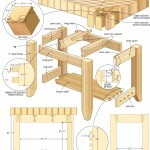 I used a combination of jig-cut through mortise-and-tenon and dowel joinery to make a strong, good-looking base. But you can choose to use just one or the other style of joinery; just be sure to take into account the differences in the part lengths required for alternative joints and adjust your stock size accordingly. I chose to make my project a standard finished height of 35 1/2″. Because the top measures 4″ thick, the final length of the legs had to be 31 1/2″. Mill 16/4 cherry down to a final dimension of 3 1/2″ x 3 1/2″ and cross cut the four pieces to length. If you don’t have access to lumber that thick, laminate thinner pieces to achieve the required size. With the legs cut, plane 5⁄4 lumber to 1″ thick for the rest of the base components and cut them to size. Next, laminate enough lumber to make up the 1″ x 15″ x 34 1/4″ bottom shelf. Clamp and set it aside to dry. While the glue on the shelf is setting, cut the mortises in the side skirts and the long and short aprons, and then the tenons for the inner top supports. Or, if you’ve opted for dowel joints, lay out and drill the holes. 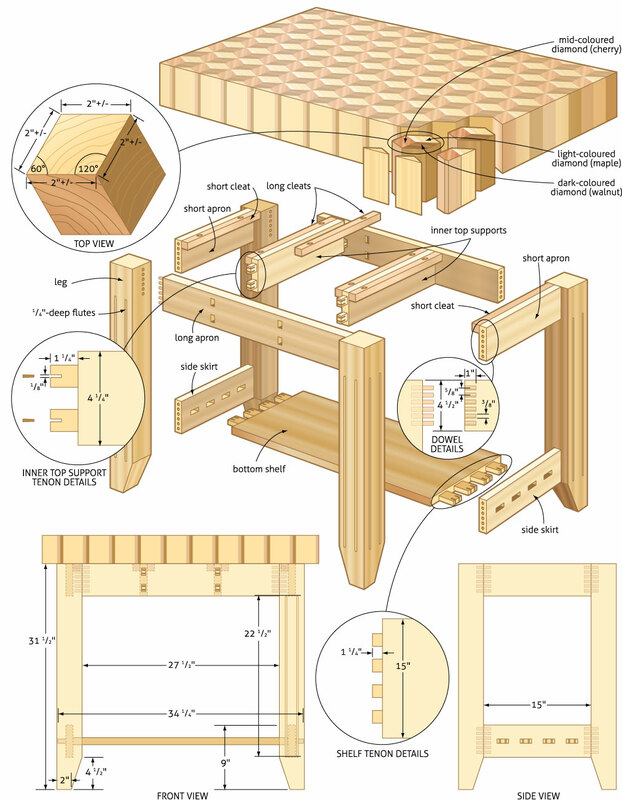 Although I’m a big fan of handcut joinery, quite frankly, the thought of handcutting the 16 through mortises and laying out and drilling 144 dowel holes for what would ultimately be a utility piece of furniture didn’t appeal to me. So, I chose to use a couple of my favourite jigs to make things easier. The mortises and matching tenons were made with a router spinning a 1/2″-diameter spiral bit attached to a Leigh FMT Pro jig. The FMT (Frame Mortise and Tenon) jig uses a set of guide plates to cut matching mortises and tenons precisely in your workpieces. It allows you to do in minutes what would take hours by hand. I created two tenons on each end of the inner top supports and corresponding mortises in the aprons. Make four mortises in each of the side skirts for the bottom shelf. Once the bottom shelf is dry, scrape, sand or plane the surfaces to remove any glue squeeze-out, then mark and cut the tenons to fit through the mortises in the side skirts. The skirts and aprons are attached to the legs with a line of six 3/8″-diameter x 2″-long dowels per joint. If you do the math, it adds up to a lot of dowel holes that need to be drilled in precisely the right places. I used my Dowelmax jig to make this task less daunting. First, I marked a line 9″ up from the bottom of each leg to show the location of the top of the side skirts. These marks act as reference points for drilling the dowel holes. Then, I marked the corresponding apron and skirt ends that were to receive the dowels, inserted the correct spacer in the jig to get the required 5/8″ offset between holes and proceeded to drill the 144 holes needed. 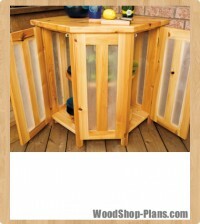 With the holes drilled, now is the time to dress up your base with decorative cuts and router details. To get the tapered foot at the bottom of each leg, simply mark your cut lines on the two inside faces, starting 4 1/2″ from the bottom and tapering down so the bottom of the leg measures 2″ square. Make the cuts on your bandsaw and clean up the saw marks with a few passes of a block plane or sandpaper wrapped around a sanding block. It’s amazing how much a small router detail can change the overall look of the project. For the base, I simply used a 1/8″-radius beading bit in my router table to apply the bead detail to the faces of the skirts and aprons, then used a 1⁄2″-diameter core-box bit in my plunge router to cut 22 1/2″-long x 1/4″-deep flutes in the two outside faces of each leg. These flutes start 4 1/2″ from the top of each leg, centred 7/8″ in from each edge. The last step is to prepare and attach the 1″ x 1″ cleats that hold the butcher-block top with lag bolts. Cut two pieces 15″ long to attach to the side aprons, and four more to 18 3/4″ long to attach to the inner top supports. Drill a 3/4″-diameter, 3/8″-deep countersunk pocket into each end of the bottom of each cleat using a Forstner bit, then continue through the centre of each hole with a 3/8″-diameter bit. With the holes drilled, you can glue and clamp the cleats in place on the inside faces and flush with the tops of the aprons and top supports. These cleats allow you to attach the top later, and the oversize holes allow for the inevitable seasonal wood movement in the top. Assemble the base without glue, checking that everything fits together well. Next, take everything apart and get ready to apply finish. Apply tape over the mid part of the tenons and over the dowel holes, then prefinish all of the individual pieces. Prefinishing is far easier than finishing the nooks and crannies that appear after assembly. I used three coats of Deft spray lacquer on my base, but tung oil or polyurethane are good options as well. Once the finish is dry, remove the tape and reassemble your base with glue. 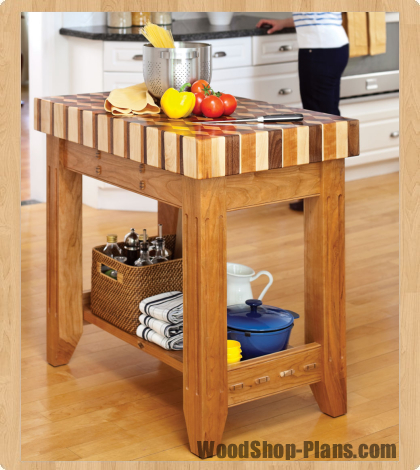 The 24″ x 36″ top for this butcher block is made with end-grain hardwood facing upward. An end-grain block is the hallmark of a professional chef, as it preserves sharp knife edges far better than a cross-grain or acrylic board. For your top, you can choose to reproduce my pattern, or you can go with a simpler arrangement of one or two species. 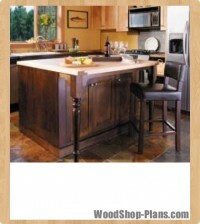 Whichever method you choose, stick with the tighter-grained hardwoods such as hard maple, cherry or even purpleheart. Avoid more opened-pored woods, such as oak or ash. 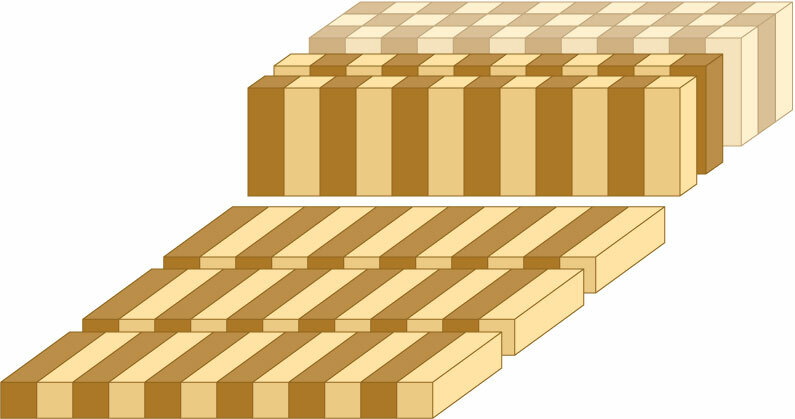 Recreating the classic tumbling-block illusion using end-grain lumber is an exercise in precision. The parts must be machined micrometer-perfect, and done in very specific stages. To make my top, I used a few specialty tools to make things easier. For measuring the angles, I went digital with the Wixey digital angle gauge to set the critical saw blade angles. I also used digital calipers for my measurements. These instruments allow you to achieve a high level of precision, and help to make sure everything goes together at glue-up time. The one other item that really helped was the Freud LM72R010 tablesaw blade that I used to make the rip cuts. This blade is made specifically for rip cuts in thick hardwood; as the lumber we are using needs to glue up perfectly right off the saw, this blade is a good investment. The top is made up of 84 hexagonal segments, each made of three rhombuses (or diamonds) laminated together to form the pattern. In order to make these segments, I started by assembling eight hexagonal “logs” 48″ long, cutting them to length later. The first step is to plane your tabletop lumber down to exactly 1 3/4″ thick and cross cut it to 48″ long. It is imperative that all of your lumber is exactly the same thickness to ensure there is no deviation between boards. Dimension all of your lumber at the same time with the same planer settings. Once your lumber is planed and cut to length, it is time to rip some angles. Set your tablesaw blade to 30° from square (creating 60° bevels on the wood) and double-check the angle. A deviation of even 0.1° will result in ugly, visible gaps later, so take extra care. With your blade angle set, rip one edge off of all of your boards. Cut all of the first edges in one session to avoid moving the fence and introducing inaccuracy. With one edge cut at the proper angle, proceed to cut the boards into strips. (See “Cutting Safety,” below, for the precautions you should take while making these strips.) The key here is to make sure that your fence is set so that the faces you’re about to saw are exactly equal in width to the faces you cut earlier. I set the fence roughly by eye and then cut a short trial cut at the end of one board. I then pulled the wood back from the blade and measured the width of the newly sawn face with my digital calipers, comparing that measurement to the width of the first angled cuts I had made previously on all of the boards. If there’s any difference in width between the first round of cuts and the second, adjust the fence and make another trial cut. Repeat this procedure until the width of each face of the strip is identical, then proceed to rip all of the required strips. You will need a total of eight strips each of maple, walnut and cherry. From your stack of ripped rhombus lumber, select one piece each of cherry, maple and walnut, and arrange them into a hexagonal bundle. Flip and rotate your pieces within the bundle to get the grain direction of each piece perpendicular to the ones beside it for the best illusion. Once you have your orientation picked, apply a coat of top-quality, water-tolerant glue, such as Titebond III, to the mating faces with a small roller, and bring the pieces together into a hexagonal log. I recommend clamping with surgical tubing or rubber cord. Multiple wraps of the cord generate a tremendous amount of clamping force at just the right angles, pulling the assembly together. Once you have all eight logs glued up and dry, you’ll need to true them using a thickness planer. Scrape off any squeeze-out, then label the sides of each log, at both ends, using the numbers one to six. Lower your cutter head in your thickness planer so it just contacts the face of your log, and then lower it exactly a half a crank (or about 1⁄32″). Feed the logs through with Side 1 facing up, then plane Sides 2 and 3. You have planed half of the faces now, so you will need to lower the cutter head again by the same amount as the initial adjustment (half a crank) and then plane Sides 4, 5 and 6. All six faces should now measure exactly the same in width. If you survive this process, it’s time to cross cut. Finally, square up the blocks for the edges of the table. Take four blocks and slice them in half on your bandsaw, cutting down through the point of the maple and through the seam between the walnut and cherry to form the filler blocks for the short ends of the top, then slice the maple diamonds in half (down through the point) for the 10 half-segments that make up the long edges of the top. Once your pieces are cut, lay out the blocks as they will be assembled. You will see that the board is made up of eight staggered rows of 10 full blocks, with half-blocks filling in the edges of the cutting board. The maple triangles fill in the edges. Now, it’s on to the fun part—the glue-up. This top was the most difficult glue-up I have ever undertaken. The hexagonal shapes make alignment and clamping difficult, the sheer size and weight of the assembly makes shifting individual pieces tough, and the limited open time of the glue meant I had to work quickly to get it all together. So, take a breather, get all of your supplies together (including bar clamps), plan out your assembly and jump in. To glue my top, I covered my workbench with plastic and laid out the entire top, leaving about 1/8″ between the segments. Starting at the top left, I began by picking up a piece, applying glue with a roller. I did the same with the next piece, and then set it into position against the preceding one. I glued up and lightly clamped the first row. I then built the subsequent rows in the same way, clamping each row individually as I went, quickly moving on to the next row, nestling each piece into the row preceding it. I then clamped the second row lightly to the first, then added the third row. Continue in this manner until all the blocks and half pieces are in place, then remove your clamps and wrap a band clamp around the entire top. Tighten the clamp as much as you can, and adjust the pieces to get the top as gap-free as possible. Chances are that no matter how precise your cuts, you are going to have some gaps left. Just try to minimize them as much as you can. You’ll fill any spaces later. Unless you have a 48″ drum sander, you will need to level the top by hand. There are a few ways to do this: you can use a belt sander spinning progressively finer grits; you can build a sled and use a 1″-diameter, flat-bottom bit in a router; or you can do as I did and break out a hand plane. To smooth my tabletop, I used a Veritas low-angle jackplane. The low-angle, bevel-up blade slices the end-grain cleanly, and the heft of the plane helps plow through the wood. Level the top, then deal with any gaps. Small ones are most easily filled with two-part epoxy dribbled into the cracks, left to harden and sanded flush. If you end up with a larger gap or two, cut a tapered wedge in matching wood the same width as the crack and slightly thicker, put some epoxy down the crack and tap in the wedge until snug. Once the epoxy cures, trim any protruding wood and sand flush. My last step was to sand to 400 grit and apply a good-quality wax. I used orange wax. It applies easily, buffs to a nice shine, is non-toxic and makes the shop smell wonderful when you apply it. The top is now ready for the kitchen; however, if you feel more comfortable with a finish that is kitchen-ready right out of the container, there are many products labelled “food-safe” that you can use. After the finishing is done, all that’s left to do is to set the top on the base and attach it with some 1/4″-diameter x 2 1/2″-long lag bolts and washers driven up through the cleats built into the base. That’s it! 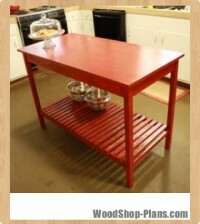 An incredibly sturdy (and a little heavy), functional piece of furniture for your kitchen. Chop, chop! Cutting the rhombus strips is tricky. The wood requires careful placement of your pushsticks on the stock and extreme caution as you cut because a large portion of the stock remains unsupported by the table due to the previously cut angle. The use of featherboards and/or auxiliary fences is a good idea. Try some practice cuts before you commit to the tumbling-block pattern. If you are at all uncomfortable with this process, modify the design into a simpler checkerboard pattern. While the tumbling-block pattern tabletop looks great, it can be quite challenging to build. 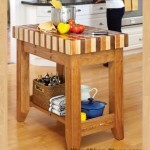 If you’d like to create a more traditional (and simpler) butcher-block top, opt for a checkerboard pattern. 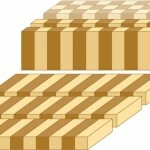 Start by cutting 12 strips each of maple and cherry, 2 1/8″ thick x 2″ wide x 38″ long. Laminate these strips on their edges, alternating the species of wood to form four blanks measuring 2 1/8″ thick x 12″ wide x 38″ long. Clamp them and allow to dry fully. You could glue these strips into wider blanks, but the 12″ width is good because it fits through benchtop thickness planers. Once the blanks are dry, plane them down to 2″ thick to even out the joints, then get out the glue again. Glue and clamp pairs of blanks into two larger ones, measuring 2″ x 24″ x 38″, ensuring they are aligned perfectly. Scrape off any squeeze-out on the central joint and allow to dry. Next, cross cut each blank into nine sections measuring 4 1/8″ long. Stand the sections on end, and arrange them to create the checkerboard pattern. You are now ready for the final big glue-up that will create the 24″ x 36″ top.